Behind a glass partition at the Microsoft store at the Roosevelt Field Mall on Long Island, 10 teenage boys settled into seats in a rectangular formation. Each sat behind a laptop computer, ears warmed by a bulky headset. Parents and grandparents circled the room, peering over shoulders at screens. One mother used her iPhone to live-stream to social media. 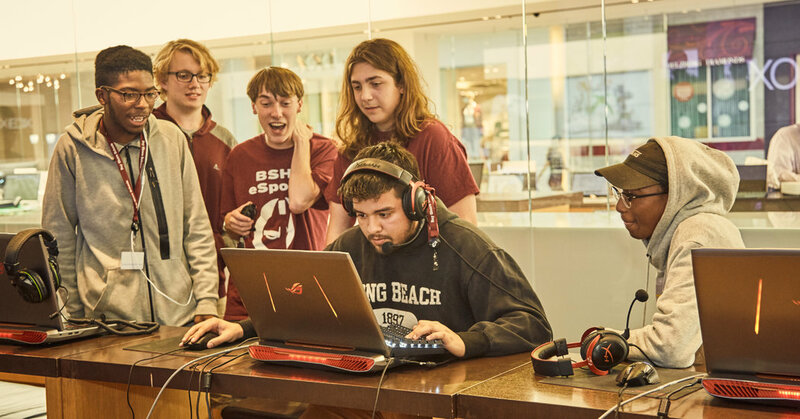 The room had the feel of a sporting event, and it was — a group of competitive video gamers on the Bay Shore High School e-sports team were competing in a scrimmage and playing their way toward college scholarships. Dimetrius at the keyboard as his mother, Anne Bostick, captures the action and his coach, Chris Champlin, watches. Multiplayer video games played competitively, often with spectators, are known as e-sports, and they have became a gateway to college scholarship money. Over the past two years, the National Association of Collegiate Esports, which is engaged with 98 varsity programs across the United States and Canada, has helped to facilitate $16 million in scholarships, according to the executive director, Michael Brooks. In higher education, e-sports live in various departments. Sometimes they are part of student affairs; some schools place them within an engineering or design program; and, more rarely, they have their place in athletics. “The games that are competitively viable in the collegiate sphere have real depth, have deep levels of strategy, and require strategic teamwork and require real mastery to be successful — and not just by yourself, within a team environment and through using tactics,” said Kurt Melcher, who runs the program at Robert Morris. A few years out of college, Mr. Melcher was the soccer coach and associate athletic director for Robert Morris By 2013, he noticed a college community emerging. Students were organizing themselves, creating their own opportunities for gaming. So he took a proposal to the university administration: What if game play were an athletic endeavor? “If you look at sports, how do you define what is more of a sport? Is football more of a sport than men’s tennis or women’s tennis, and is golf more or less of a sport than hockey?” he said. E-sports players at U.C.I. devote 15 to 20 hours a week to the sport, Mr. Deppe said. Players scrimmage other teams, watch Video on Demand footage to evaluate performance, participate in team meetings, sit for biweekly sessions with a team psychologist and work out once a week with a personal trainer. The physical workout is e-sports-inspired: aside from general cardio, routines emphasize strengthening core muscles, arms, shoulders and wrists. Organized competitive gaming on both the high school and university levels lives in purposeful defiance of the gamer stereotype: as Mr. Melcher said, “a kid locked in a basement, antisocial, angry, drinks 50 Mountain Dews and doesn’t sort of become a valuable person in society.” In the educational sphere, game play often brings students out of basements and bedrooms. The team plays through the High School Esports League, a body that organizes competitive games and serves as a recruiting pipeline for college e-sports programs. The league has dozens of recruiters looking for scholarship candidates, said Mason Mullenioux, the organization’s chief executive. Many players create online profiles through universities or organizations like the high school league so that schools might find those students who both meet academic requirements and play the desired positions on their high school teams. “The last thing you want to do is you spend a lot of time talking to a person in game, only to realize that they’re a 50-year-old doctor in Cambodia,” Mr. Brooks said. Generally, recruiters look for high school juniors and seniors, Mr. Brooks said. The industry is in its infancy and changes quickly — by the time middle school students are ready for college, the games they are playing might not even exist. Meanwhile, some schools offer e-sports scholarships not associated with teams or specific games. New York University awards an e-sports scholarship to one student per year who is active in the gaming community and interested in working in some part of the gaming industry. The Evo Scholarship is funded by subscriptions to the Evo tournament livestream and by the fighting game champion Daigo Umehara. As Bay Shore players with usernames like Wobblyturtle, Oddgecko, REC, Grassyabyss3 and Glass competed at the mall, Ryan Champlin watched and supervised. He has already received a scholarship offer from Menlo College in California. The Silicon Valley school is offering “almost a full ride,” Ryan said, in the form of an athletics scholarship for e-sports and a leadership scholarship that would make him assistant director of the e-sports program. “The same scholarship if I was playing football or lacrosse,” he said. 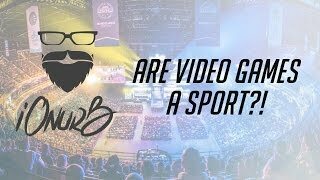 Are VIDEO GAMES a SPORT? !